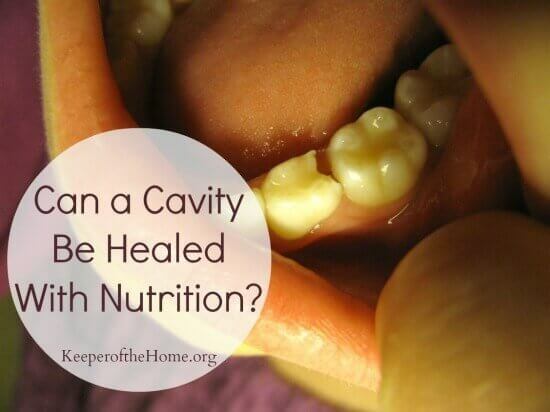 You are here: Home » Blog » Family Life » Can a Cavity Be Healed With Nutrition? I’ve probably had 15-20 cavities filled in my 32 years. Up until a few years ago, I always thought that cavities were just an annoying thing that happened, and there wasn’t a whole lot we could do to avoid getting at least a few. Lower your sugar intake, brush and floss well, and you’ll get less, right? When they do happen, simply get it drilled, and if you’re health conscious you can choose the white fillings over the silvery ones containing mercury. End of story. Then I read the book Nutrition and Physical Degeneration by Dr. Weston Price about four years ago, and my thinking shifted entirely. I now believe 100% that teeth can be strengthened and remain cavity free through real food and traditional nutrition. Not only that, but even once a cavity has formed, it can be remineralized and filled back in again, quite possibly requiring zero dental work. I know this is a highly controversial issue. Would it surprise you to know that the most viewed (and most ferociously challenged) post on this entire website is Rethinking Oral Health Care: A Homemade Toothpaste Recipe for Tooth Remineralization? Even the mere idea that teeth can be remineralized through any method brings about loud protest from the dental health professionals. To some extent, I get it. It’s so far-fetched compared to what we’re learned about oral health. Sure, many of us believe that eating differently can help us lose weight, have more energy, manage diseases like diabetes, reduce behavior problems in children, even help to balance hormones. But heal and re-fill areas of decay that have already formed in our teeth? It’s crazy, I know. Our family has had one small experience with this, and below I will share more stories with you. My daughter Abbie had a small-medium sized cavity that the dentist wanted to fill, but as we have no dental insurance, we postponed it for a little while since it wasn’t bothering her. I worried that in the interim months (it was about 3-4 months) it would get much worse. To my complete surprise, when she went back in to have it looked at, the dentist said it was only a pinprick and didn’t even need drilling. The main thing that had changed in those months was that we significantly increased our consumption of grass-fed raw milk and butter (and this makes sense if you read Dr. Price’s book or any of the literature out there on the dietary changes that will heal decay). The story below comes from my dear friend, Renee. As you read it, you’ll quickly see how similar we are and you’ll understand why we like to call each other to discuss the canning jars we scored at a thrift store, which flavor of cod liver oil is working out best for our kids, and how we just made a really fantastic new batch of homemade deodorant. After coming home from Africa a year and a half ago, we dutifully began making rounds as a family to doctors and dentists. Missionaries always take any chance in their home country to catch up on needed work while in a familiar setting. We were no exception. Reese, who had just turned seven, went in for a dental check. Her teeth looked good and felt great, but surprisingly we were told she had eight cavities that needed filling! We were very surprised and suspicious, to say the least. I did not have peace at all about the diagnosis and with support from my husband, I began the journey of researching teeth. I began by praying a lot, not sure where to start but knowing that I needed to find out why and how cavities were invading her mouth. We moved shortly after the initial check up and x-ray exam and began looking for another dentist in our new area. I didn’t want to ignore the cavities and cause them to get worse, but at the same time I was feeling very strongly that I needed a dentist I could trust. It was taking more time that I realized. I tried several but came away frustrated at how they pushed antibiotics and root canals for a problem that wasn’t even proven to be there. While I continued to pray for the right dentist to address Reese’s problem, the Lord began to bring things to me. I had been learning lots about health and natural medicine for just about as long as I had been alive. My mom taught me many things and now as a parent, I couldn’t soak up enough information. I was eager to help my kids have the best health possible. I really believe the Lord was leading me in my study. Books came to my attention that I hadn’t read before. I became fascinated and ecstatic after reading Weston Price and his ‘Nutrition and Physical Degeneration‘, and then Ramiel Nagel’s ‘Cure Tooth Decay‘. Everything began to come together after I read that book. I had researched and tried raw un-cooking for a time, was a vegetarian for a time, learned about the foods recommended for your blood type, the Makers Diet, the PH Miracle, and again and again it came back to simple things. Stay away from refined foods and sugar, put in plenty of good fats, raw foods and soaked grains. We finally did find a good holistic dentist but it was about the time I began to come up with a plan to reverse Reese’s tooth decay. I asked my husband to give me 3 months to work intensively with Reese. We did the best we could. We took away all forms of sweetness, even natural things like honey and fruit. We took out all refined foods and stuck to lots of vegetables and soaked grains. We ate tons of Kerrygold butter and raw cheese. I gave her a double dose of fermented cod liver oil every morning with her raw milk. We also began using clay toothpaste. She was such a good sport about the whole thing! Of course there were days that weren’t perfect but on the whole we were very diligent. We finally made an appointment for her at the dentist. They cleaned and x-rayed her teeth and found NO cavities. There is a tooth that had actually started to decay on the back side but got hard again. They were very encouraging and I was completely amazed. I had hoped that at the least one or two would be completely gone, but to have every one healed, I just praised God and stood in awe! I really believe that God led me to study and healed Reese’s teeth. He is so good and he sees how much we want to care for our children and provide the very best for them. Call out for wisdom; His word promises that He will answer! Green Pasture Cod Liver Oil/Butter Oil— This is the cod liver oil that our family takes. The kids take the chocolate cream variety, and my husband and I take the capsules (well, sometimes I take the cream instead). You can purchase it through Amazon, although the way to get the best prices is to find other friends or family to go in on a large order with you and purchase at least 6 or 12 bottles to get a better discount directly through the Green Pasture website. Rethinking Oral Health Care: A Homemade Toothpaste Recipe for Tooth Remineralization @ Keeper of the Home. Or another toothpaste option on this site… Homemade Clay Toothpaste. This is the one our family uses the most often, although while traveling we’re using the clay toothpaste that we purchased from Redmond. If you have a story to share about how you used nutrition to heal teeth, we would LOVE to hear it! I’m totally pinning this information for later. 🙂 Thanks, Stephanie! EXCELLENT article and excellent resources! Couldn’t agree more! This is crazy! I had recently heard about fermented cod liver oil healing cavities, so I’m not too surprised to hear this story…but still, wow. This article is a great resource. Unfortunately, it isn’t rare to visit a dentist and be told there are multiple cavities requiring fillings. As a child, I was told that I needed 4 fillings. My parents couldn’t afford to do it at the time and then we switched dentists…no cavities! (And this was decades before I’d even heard of Weston Price). Fast forward about 20 years. A visit to a dentist revealed 13 cavities, 3 urgent! (In a mouth that had no fillings, mind you!) I decided to go for a 2nd opinion and am glad I did…the 2nd dentist had the x rays and could only find the 3 “urgent” which he described as small. He even took the x rays to a colleague at the state dental school, and the colleague couldn’t find them either. It has been an additional 5 years or so and none of the “non urgent cavities have needed work. If a person breaks a bone, doesn’t the bone remineralize and heal, sometimes stronger? If this is the case with a bone, why NOT with a tooth??? Wow! I must have had really great dentists! None of my siblings or I have ever had cavities! We grew up getting cleanings/exams twice/year. This is such a timely article for my family. My 8 yo daughter recently started complaining of a really bad toothache. We took her to a holistic dentist whom I trust and came recommended from my other “weird” friends that take cod liver oil and ferment their foods, etc… 🙂 Anyways, he found 8 cavities. 5 go to the pulp and there are three tiny ones. He is recommending 5 root canals and 5 crowns starting with the ones that are bothering her. He said that it is possible to remineralize teeth but that when they get down to the pulp and start bothering you they need filled and won’t heal? She is in pain pretty much every day and is supposed to get the two causing the pain done Thursday. I had just started reading about healing your teeth before this came up so I feel new to it all. Has anyone had experience with truly large cavities healing? I haven’t personally had any experience with cavities going down to the pulp. I have a friend who is doing this diet with her daughter who also has very large cavities. I would really recommend you pray and know that the Lord is calling you to do the root canals before you do them. This sweet little girl began the diet, but the process of healing has been slow. She is pain free which is a praise and they do seem to be healing. She did get one root canal and had infection, swelling and pain. Her mom decided that what she was doing with her daughter was probably better in the long run. We’ll be praying you know what to do! This is great, thank you. I had read a similar article from Sarah Pope a while back when I went looking for solutions for my daughters pinhole cavities they wanted to drill and fill. They were so tiny, hardly there, I couldn’t imagine putting her through all of that! I figured that there has got to be a better way. It makes sense to me. So we have had her on the fermented CLO/butter oil blend from Green Pastures (ran out a few weeks ago and have yet to replace it but we will) and took out all cereals (she loved cereal and ate it frequently, even though we bought the “healthy” versions it was still more grains than what I wanted her to have. We cut out processed foods but not completely. We switched to pastured butter. I have heard of something called “MI Paste” that I want to get for brushing as well. I wish I could have gotten pics to compare her teeth then and now but they are the last teeth and it just didn’t work. I go back and forth on whether I think they are shrinking or not (it’s been about 3 months) but I do know for 100% certainty that they haven’t gotten any worse. So we will keep doing what we’re doing and keep an eye on them. I will def be back and post our testimony once we achieve full healing! I’m good with giving it a good 2-3 more months at it because at that time it will be my turn for a check up at the dentist and I’m hoping I can bring her with me so they can confirm with me. 🙂 Can’t wait! Our bodies are amazing! Does anyone have any experience with enamel hypoplasia? My 6 year old’s teeth have all came through with almost no enamel. In spite of a mostly healthy diet, she had cavities on all her back molars before they were even all the way through her gums! I have been giving her FCLO and feeding her the most nourishing foods she will eat (she is super picky), I just don’t know if these measures will be enough with this particular condition. Great article. We have recently decided to visit a holistic dentist and they too follow Weston A Price Foundation. It is amazing the healing properties our bodies have. The dentist spoke quite a bit about how diet affects the way our face is formed and as such how are our teeth/jaw are formed. He can tell when children have had poor nutrition just based on the look of their face! I am looking forward to healing some major cavities in my teeth with nutrition. I am not surprised that the dentist found cavities. I have had several similar situations and come to the conclusion that there are many crooked dentists just trying to make a buck. This year my dentist was out sick and his sub found two cavities. They were very belligerent when I did not make a follow up appointment. When my regular dentist came back, he tried to smooth it over but told me I had no cavities. Yes, we did think that several of the cavities might have been false ones. But, the picture at the top of the page is one of Reese’s decayed teeth. This tooth hardened back up and was declared decay free by our dentist! Great article! I have horrible teeth and thankfully have a dentist that DOES believe that teeth can remineralize. I’ll be taking some of these tips and solutions. Thanks! did you only do the raw milk and butter? no cod liver oil or butter oil? No, we were also using cod liver oil/butter oil, but not any more than we were when we first got the cavity, just the same amount (I probably should have upped it, but didn’t at that time). I just know for certain that the milk and butter in our diets increased. Note that I wasn’t making a particular effort to deal with the cavity, but it was more of a coincidental thing, as that change in our diets went along with the time when her cavity improved. If you really want to intentionally heal cavities, the protocol is more purposeful and stringent than what I did (more like what my friend Renee did in her story). What I do NOT like about Ramiel’s book “Cure Tooth Decay” is twofold. One, he remarks how bacteria play no role in decay, which is incorrect since we now have electron microscopes and we can see them in action. With over 700 species of microorganisms in the mouth and not one has an effect on enamel? Some oral bacteria are incredibly virulent and can do incredible damage. It is an ecosystem in there. For some of us, that ecosystem is ideal for the microorganisms that live in the nooks and crannies on enamel and produce acid. Just ask an Oral Microbiologist. Secondly, I find his comments (both in his book and in podcasts and youtube videos) very insulting towards the entire dental profession. I can understand that he has a personal issue with dentistry because of what happened with his daughter, but he paints the entire profession with the same brush…calling all dentists liars, for example. I have communicated my concerns with Ramiel personally, and I felt that he was defensive and attacking…maybe because I identified myself as part of the dental profession…I’m not sure. Because of these things, I would NEVER recommend his book. Having said that, the diet that Weston Price recommends is wonderful. Diet plays an incredibly HUGE role in decay and remineralization. Give it a go! And Weston Price has long been considered a pioneer in dentistry. He was on to many things during his studies…but unfortunately, since he didn’t have the kinds of microscopes we have today, his observations lacked a few of the pieces of the puzzle. Thanks for your comment! I encourage moms to really search the books and info to find how God leads them. I wouldn’t throw out an entire book, but I would definitely challenge moms to use discernment as they read and study these issues. Thank you for your comment. I would like to point out that your first reason is acceptable and noteworthy. Your second reason is emotional, personal, defensive itself, and not really a reason to disparage a person’s work. We can still learn a lot from people who’s personalities and manner are not to our liking. We should look at the facts and not always at the messenger. So in that case, it is probably better to just stick to encouraging people to do their research and weigh carefully their choices, rather than dissuading them from a course of action, which may significantly help their situation, simply because one person advocating that action can seem rather arrogant and stereotyping in their presentations. Hope you understand what I am saying. I am not trying to be a jerk or seeking to chastise you in any way. I know when words are in black and white type it is sometimes hard to discern the writer’s intent. Mine is not to be in your face, but to encourage you to either stick with facts or with personal feelings, but don’t try to meld them both into compelling factual evidence for or against something. Thanks for your post. You are definitely not being a jerk or chastising me in any way. I was under the impression that in a blog, people are allowed to share thoughts, opinions and experiences. I think what I am trying to say with Ramiel’s book is this…the sense I get from postings about dentists, dental offices, and dental professionals on some natural blogs and websites is an underlying tone of “they’re all a bunch of liars, trying to rip us off and get rich off us”. As a dental professional, I feel saddened by that. Many dental professionals are extremely open to alternative methods of caring for ones teeth, whether science backs it up or not. But I have problems when the messenger of an idea paints the dental profession in such a negative light, as in Ramiel’s book, his website, his podcasts, and videos. I am just trying to caution people on his wording and his tone. I’m working on this right now. My 8 year old has 6 cavities where the fillings have broken down and need to be refilled. I’m going to go ahead and have this done. However, I avoided a root canal suggested by my regular dentist by going to a specialist who tested the questioned tooth and pronounced it healthy. I’m also going to heal an abscess beneath a tooth so there is no reason to pull it and put in a spacer. We’re doing CLO/BO, raw milk, more butter and cheese plus tons of vitamin C and bioflavonoids to heal the abscess. Due to various reasons, I can’t really pull all sweets and do more veggies, so I’m trying to do the best I can. I have read that just doing CLO/BO can have a great effect on weak teeth. Which would explain why I never visited a dentist as a kid, and yet, when I turned 18 and went in for a cleaning – the first I had ever had, as I thought at that time my parents had somehow done me wrong concerning dentistry- they found 14 cavities. I couldn’t afford to have them ‘fixed’ and they didn’t bother me, so I waited. After I was married at 22, they found no cavities when I went in to have my wisdom teeth removed. I think even having my wisdom teeth removed was just a money grab. Sorry to sound skeptical. My mother fed us an excellent diet and I am thankful. I think genetics has a lot to do with oral health. I have never once had a cavity or any dental problems. The dentist didn’t even think I needed my wisdom teeth out (which didn’t come in until I was 23! ), but I went ahead and got them out when I was able (had dental insurance and didn’t really think much of it back then). I am 32, never floss (but brush lots! lol) and every time I go to the dentist, I’m told my teeth are perfect. My husband, on the other hand, has a mouth full of cavities and has had a lot of dental issues. We were both raised on processed diets. I’ve read about this before. Not sure what it would look like though for someone who has no access to some of the things that he recommends like raw dairy and the good kinds of cod liver oil. I did have an experience though where they told me I had two cavities (first ever, and at 27 at the time) but then when they looked again as they were drilling for the first one they said that they would wait on the other and “see what happens”. Later, they told me NO cavities. I also read an article once about a man who went to a few dentists and they each told him he had cavities in different places! Its hard to know what is real and what is not and who to trust. But it does seem worth it to try. But what to do about the lack of access to some of the things he recommends for healing? thoughts? I’ve thought about that alot. We are missionaries and have lived in more primitive places. I think it would take some study and exploring of the culture you are in. I think the essentials are in every culture… I really believe God provides for his children wherever they are. In East Africa we had good fish, fresh veggies, raw honey, sesame and olive oil. In West Africa we had amazing palm oil, herbs, avocados. Ethiopia uses firmented butter, Europe has fantastic cheese, Argentina has good meat. If you take time to search your area and pray, I believe God will show you what you need. I hesitate to even enter this discussion as so often I am dismissed BECAUSE of my dental degree. It is interesting to watch these discussions with my education and background. But very quickly, cavities come on suddenly like a sinkhole but the process is one of pH balance…too low pH for too often and the the body cannot heal the area, weakening it until that fateful sinkhole happens. We see the “decay process” on an xray for cavities between the teeth and try to intevene before a huge sinkhole forms. So far, I have never seen new tooth structure grow in the holes place, but the weakened tooth tissue can strengthen itself back again given the right pH and mineral environment. I tell my patients that there are 3 things that affect decay, the host (this is where weston price stuff comes in), the bacteria (some of you mentioning you never had a cavity probably have a very different microflora than those with constant troubles), and environment (diet and hygiene). I personally think bacteria is the most important factor, but they are all in balance so some people that start pumping cod liver oil and avioding high phytic acid foods can see remineralization of earlly lesions and arresting of advanced decay. Others will not. My personal experience with this is that it is very unpredictable, but i welcome mom’s to try it and we monitor things more closely as I learn new things as well. As far as we dentists are concerned, you have all figured out that we all have different knowledge bases as far as this holistic stuff goes as well as different criteria (agressive or conservative) as to when to intervene. Furthermore, some intervene with the best intentions for the patient and some seem to do so with the best intentions for themselves (unfortunately). So the wise choice would be to ask around and get a second opinion if you are not given choices and communication as to your care. *Moderator, please use this one instead as it is the proofread version***** Thanks. I hesitate to even enter this discussion as so often I am dismissed BECAUSE of my dental degree, but it is interesting to watch these discussions with my education and background. What we know now about decay is that cavities come on suddenly like a sinkhole, but the process is slow and one of pH balance. If the pH is too low for too often the body cannot heal the area, and it weakens until that fateful sinkhole happens. We dentists see the “decay process” on an xray for cavities between the teeth and try to intevene before a huge sinkhole forms (like the one on the picture at the top). So far, I have never seen new tooth structure grow to fill back in the sinkhole, but weakened tooth tissue can strengthen itself back again given the right pH and mineral environment. I tell my patients that there are 3 things that affect decay, the host (this is where Weston Price stuff comes in), the bacteria (some of you mentioning you never had a cavity probably have a very different microflora than those with constant troubles), and the environment (diet and hygiene). I personally think bacteria is the most important factor, but they are all in balance so some people that start pumping cod liver oil and avoiding high phytic acid foods can see remineralization of earlly lesions and arresting of advanced decay. Others will not. My personal experience is that it is very unpredictable, but I welcome mom’s to try it and we monitor things more closely. If you go back and reread Nagel’s book from this perspective, instead of attributing all his conclusions to a different diet look at it instead from the context of low sugar and healthy bacteria. It still works as to why there is no decay in those populations! As far as we dentists are concerned, you have all figured out that we all have different knowledge bases as far as this holistic stuff goes as well as different criteria (agressive or conservative) as to when to intervene. Furthermore, some intervene with the best intentions for the patient and some seem to do so with the best intentions for themselves (unfortunately). So the wise choice would be to ask around and get a second opinion if you are not given choices and communication as to your care. I appreciate you sharing your expertise and experience! I’d love to find a dentist with your mindset, one who understands that a dentist’s role is valuable but cannot replace the patient’s responsibility for their own nutrition choices. Your willingness to offer support and keep an eye on things if one chooses to attempt to improve their dental health with nutrition is something most dentist won’t do. You brought up great points about pH, bacteria, and diet and hygiene, which are essential to this discussion. Thank you very much for commenting! I am so thankful for your wisdom. I hope moms out there will focus on learning and educating themselves about this issue rather than blindly following any specific book. I do think the issue involves the ph balance, but it takes a lot more study than just one or two books to understand all the facets of tooth decay and remineralization. Well said. Loved your honest assessments. how in the world does one find a dentist that has your opinions. And also most dentists do not even know about herbs that help. All you need is proof. Visual, documentation. I have all the dental records if anyone needed to see them. I kept them for this very reason, to have hard documentation of cavities that we were going to billed for. I’d love to see them and give you my opinion. Did you go to a pediatric dentist or a general dentist? Can you get my email from one of the moderators? My son is dairy free due to food sensitivity and other health issues. He has terrible tooth decay so bad one broke off. Any ideas for getting the nutrients from non dairy sources? We already eat a real food diet with no sweeteners. Did you replace the dairy with rice milk or almond milk? Depending on what types you buy, those will have more than enough sugar to cause teeth to break down. Great article on cavities and nutrition. I’m goiong to pass this on to my daughters-in -law as I have 10 grandkids under the age of 6 yrs. Any advise on how to keep the enamel from wearing off? Do you think this is possible for a person with dairy allergies (like my son)? If so, how? *Thanks for the info! We dont consume dairy, except for ghee, which is basically what butter oil is. We have been on the GAPS diet, and while my kids’ guts are healing and their eczema is improving, they still cannot tolerate dairy, even raw and fermented. We still manage to get the nutrients we need with bone broths, meat and eggs. The liver thing is something I need to work on though, I guess. Anyway, I totaly think it is possible! Great job! But some of us cannot do much or any dairy, even good dairy, though that works better than regular dairy. Weston Price has great information, but with so many folks looking for other answers than dairy, I, too, began to study. In my praying and searching I came upon 2 things: dental formula and calcium tea & syrup. Both of these will work well for mst people, even without the diet changes that have been wisely suggested here, I personally think dietary changes should come first but many folks really struggle with these and sometimes their budget or their allergies prevent them. So take a look at these. We have had startling results! Fill jar 1/3-1/2 full of mix And Cover with a mixture of Glycerine & Alcohol or glycerine only if you wish. Set for 4 weeks, strain and bottle. Take this by the dropper for children, up to 3 times daily. Adults can take more. Small children half doses. Keeps indefinitely. Do not take if nursing- tends to dry up milk supply. Do not take if pregnant. Usually the cavities respond well in 4-6 weeks or less for children. Oldrer folks may take longer. If this is not enough, at the end of six weeks stop and switch to Calcium syrup. Bring 2 qts water to boil. Turn off burner and add 1/2 cup of herb mix. Let steep for an hour. Strain herbs from water. Return kettle with tea to burner and simmer the 2 qts. at a very low heat until you have only 1qt remaining. Add 1 cup of honey and 1 cup of raw apple cider vinegar. This makes a syrup. Refrigerate and use by the spoonful a few times a day. Extremely high in the minerals needed to rebuild enamel, take away restless legs and stop cramping. Safe for pregnancy. The dental formula can be purchased from Elysiumnaturals.com 616-965-1549, if you do not want to make it. The Calcium tea mix can be ordered from Natural Answers 717-692-5100. Hope you can add dairy but if not these usually work. When they do not, it appears that the person usually also struggles with low thyroid. Do not use sugar, juices and lots of fruits when trying to heal tooth enamel. Do not over brush at this time since the cells that are rebuilding can easily be damaged by heavy brushing. It is so exciting to me to see, finally, that God really did mark our teeth to rebuild, just like our bones do. Always thought they should. Is that 1 1/2 cups of black walnut? Or ounces? Thanks. I got your book recently and am so grateful for your information. Thank you, Thank you for your input! I’ve just learned how to make tinctures and am just amazed at how God provides for healing through what He has created. I’m so honored you would post! Rachel, can you let us know from your Dental Formula recipe how much of the Black Walnut to use? Like others, this article has come at just the right time for us. I went to the dentist about 8 months ago and had five cavities found. I really didn’t want them filled, so I decided to wait. I didn’t do any CLO or raw milk, but flossed every day, used homemade toothpaste and then went back last week. I had only three. One of which, he said has gotten deeper (it was in the dentin and is now more so, which I have heard cannot be remineralized). I made an appointment for the fillings. So that’s me… My daughter, who is almost 7 and has BEAUTIFUL teeth, apparently has a weird shaped tooth that has a “cavity, well, almost a cavity” according to the dentist. He really wanted to fill it. But, we just don’t feel right about it. Is he going to MAKE a cavity where there was none? We cannot afford the fillings (mine either) and I really don’t like the idea of mercury being in her mouth. So, when I saw this article, I was so excited! Here is what I am wondering: does CFO taste fermented and fishy and gross? Because my daughter won’t take it if it does. And CAN dentin be remineralized? Do I HAVE to use raw milk and cheese and butter to remineralize? I am not sure I can afford that expense right now. Thanks for any input – I am totally willing to try the fermented Cod Liver Oil. And we don’t eat much processed food at all (apple sauce, salsa, spag. sauce…all of which are organic and small ingredient lists, no weird stuff at all in it.) What do you think? I think that the raw milk and the fermented cod liver oil really did help, but also taking out fruit and all sweeteners. Juggle your budget and try it for 3 months, see if there is any improvement. It’s worth a try! I’m pleased to see the positive dissemination of beneficial and positive information. I am saddened by the offense that medical professionals take when implications are made that their evidence based education and training is viewed less than the ultimate truth. My background is research, -chemistry/medical/physics. I’ve presented papers in numerous countries, I’ve jumped through hoops and skirted around parameters because presenting EVIDENCE based information that is contra current information, such as in the TEXT BOOKS in dental schools is equivalent to squeezing an elephant through a key hole. Believe me, intellectual information suppression is a real thing in the upper ranks. Peer review is a nasty business- and a ‘business’ it is! If there is money to be made then that piece of information will be snatched up. If the information is going to have a back lash form the public, forcing the involved industry to change the practice and it will co$t someone, then the peer review of a certain paper will be unfavorable- and published in an abstract and ignored. The U.S. has done this in a very bullish fashion. I’ve seen this with my own eyes. How is this information ever going to trickle down to the public? Very often, never. Medical professionals: please do not take offense, you dedicated your time and soul to helping people, however, the golden evidence you were taught at big-pharma-funded schools (follow the money trail) is not accurate 100% of the time. Be critical thinkers i.e. why is the U.S. only one of a tiny few countries to allow fluoride in it’s water? [Fluoride does NOT help teeth in any way- fluoride assists in absorption of aluminum in the body, #1 cause for calcification in neural sheaths in brain over time = ALZHEIMERS. Also fluoride is an integral component in psychotropic drugs because of is channeling facilitation of chemicals] Nothing that is immediately toxic will not make the news. What we have is information that is incredibly difficult to interpret by the general population, but the information IS out there but it’s discredited by the stake holders in industry. People are bombarded by disinformation, the media is powerful and sound very believable. Having a degree in a certain field is not enough, since textbooks are written by the same sources. Dr. OZ is one good example. A physician who is a very good doctor, but like most doctors his bag is filled with 51% western pharmaceutic practice + advertising and 49% common sense advice/tips, the show is presented in such a way that it’s all mixed in such a way that it’s very provoking and memorizing. Please I implore both medical professionals and general public, use CRITICAL analysis, don’t believe someone because they have a phD, or because some holistic website said it works. The internet is your best friend, do research, if it seems logical try it, judge your own results. My last word: Home mad tooth paste of baking soda and a peroxide water rinse has kept me from any dental work, even calculus build up is minimal- I had my teeth cleaned 6 years ago and the hygienist said there was hardly anything to scrape. I agree with everything you have said in your story about praying to God and, of course, about limiting your daughter’s sugar intake, but I hope you’ll rethink the fact that you’re giving her cod liver oil daily. My husband’s grandmother was a firm believer in taking a daily dose cod liver oil, and she died of cirrhosis of the liver. While she was very healthy most of her life and lived to be 92 years old, she suffered terribly at the end. This was a woman who seldom drank. She would have a glass of wine once in awhile. What happened to her was that she oviously had consumed too much Vitamin A during her lifetime by taking the cod liver oil daily and damaged her liver. That’s wonderful that you’re improving your dental health, but I hope you’ll look at the whole picture, and check with your daughter’s doctor to be sure that her daily intake of cod liver oil is not going to harm her in any other way over time. Thanks so much for gathering all these links and resources in one place. I look forward to referring people to this post for more details on the nutrition-dental connection! This isn’t exactly nutrition, but my son’s dentist recommended a xylitol paste to put on his teeth that is supposed to help reverse cavities. Have you heard of this? If so, any opinions? Yes, xylitol has been shown to harden teeth. What I’ve heard is that it’s not the best in your body, but on your body (teeth). We have Earthpaste and a Xylitol toothpaste in our cupboard at all times since my husband doesn’t really like the clay toothpaste. I read all this with great interest , amazed, but sorry not to live in USA ……..I will try to order the Earthpaste here in Sweden and give it a try ! Thanks to you all for your comments ! I think it depends on how bad the cavity is. There will be times when only a dentist can help. I did not even think about this. I had to have Periodontal surgery a couple of years ago.. I asked the dental surgeon what if anything that could be done to help with the surgery. He really had no help. So I started doing online research, and with a limited medical background started brushing about 6 weeks before the surgery with liquid magnesium/calcium supplements. My overall oral health increase, my teeth began to become whiter and after the surgery I was healed in about 2 weeks, which the surgeon was totally surprised at, he even asked what I had done and when I explained he could not believe that it worked that well. Thanks for letting me tell my story and I loved the article..
Amazing story Stephanie. There’s some real good evidence here and some truth to this. I am going to dig deeper into this. Thanks so much for sharing! So much wonderful feedback. I am also intrigued to know how Celiac and grains play a role in dentistry. I know that growing up with undiagnosed Celiac, I had very limited tooth enamel and plenty of cavities. My children are also Celiac, but eating grain free and have beautiful healthy teeth. I’ve been using straight bentonite clay and magnesium powder on my toothbrush for a few weeks now, hoping to heal years of dental and gum damage. Nothing ventured, nothing gained, right? This is very intriguing to me. I have been studying Weston Price, but- any recommendations for children who are milk protein intolerant? I think I will try the black walnut tincture suggestion above 1st, along with implementing WAP the best we can. The decay has stopped, but it is very visible (very front top tooth) and will be obvious if it starts to heal. We have had a few dentists want to get at it, one suggesting it was urgent, even though the decay has stayed the same for years and she is not in pain. (It is from when she was 1 and I was nursing her through the night without brushing her teeth. Which is what I did with all of our other children, but this is the first time we were on well water (no fluoride). I am so interested in doing this for my cavities. I’m having to go to a free dental clinic because I don’t currently have insurance and my tooth hurts. I want to know which foods I should eat? Will it only work if I cut out fruits and honey and everything else that’s naturally sweet? If so, what do I replace those foods with? Hi, I recently have spotted a small-medium cavity in one of my front top teeth, I decided to give healing a try and I went on a 100% raw diet, my current diet about 55% vegetables and 35% fruit and 10% nuts. I really have no idea where to get raw milk as I live in an urban area, and I’m anxious that the cavity might get worse, I don’t know if I should go to a dentist. Cavity can be definitely healed by a nutritious diet..but if it is preferable to visit a dentist if the cavity persists for a longer time..